It is also up to the player to make sure they choose the right tee to fit their ability. Most golfers agree that next to flubbing an easy shot, slow play can be the most frustrating thing about golf. Recently some people in golf, particularly course operators, have made a real effort trying to speed up play. Some of their methods have helped. Something that will speed up play is golfers playing from the set of tee markers which best fits their game. Using the most suitable markers for regular play can also allow a golfer to enjoy his/her round more. Getting more fun out of golf is desirable, whether by a 25 year old hitting his drives almost 300 yards, a woman in her 40s weighing around 100 pounds capable of about half that distance or a retired male executive who has played golf most of his life, but now hits it somewhere between the distance of those two. The likelihood of anyone's joy at golf is increased by their being able to reach most of the greens in regulation -- to have putts at birdies. If any golfer has to take an extra shot just to reach a green, they are going take more time to complete that hole. In the "follow-the-group-ahead" way in which golf is played, slower golfers (even one) hold up everyone behind them. So the length of golf holes, especially those too long for certain golfers to reach in regulation, can directly affect the pleasure or frustration level of those golfers and of others on a course. How do golfers select the tee markers best for them? It has been suggested that handicaps should be the basis for choice of tees. That way, however, might not properly consider golfers who are short and straight hitters with great short games compared to much longer hitters, who are wild and have no touch around the greens. Important questions also are, how course operating personnel and officials for a competition should set up the length of the holes to consider the golfers who will be playing. An answer to each of these questions is by using the length of golfers' drives as a guide. I measured the length of the "normal-distance" of the shots for all the clubs of representatives from eight major "types" of golfers. Their distances were given in an earlier write-up titled, The Long and Short about Golfers. From those figures, some possible conclusions were given in my, The Long and Short About Golf Holes. A matter mentioned in that second piece was a surprisingly similar relationship between the various clubs of golfers, despite large differences in the length of their shots. So from my measurements and earlier conclusions, I want to try to give some guidelines on the desirable length of golf holes for different golfers. These hole lengths are figured from the distance a golfer normally hits her or his driver. The limits which golfers could reach the center of greens in regulation is also given. Hopefully, this data can assist golfers in choosing the set of markers best for them and for courses to more ideally fit the length of their holes to their golfers. The charts below gives hole lengths based on the normal-distance for six lengths of drives, from 125 yards to 250 yards. To use these charts, a golfer should find in the left hand columns the closest distance to the normal length of their drives. Then for each of the par holes, they can read on that line what could be approximate length of a hole reached in one, two or three strokes, if on their approach to the green they hit their next longest metalwood to their driver or their 5 iron or their 9 iron. The figures under the metalwood represent the maximum hypothetical length hole they could reach the center of a green in regulation. The "Min." is for the hypothetical par 4 hole just out of the reach of a golfer with their driver. Under the par 5 hole the Min. is unreachable with a golfer's normal-distance drive and then metalwood second shot. In these charts a golfer can find the range of hole lengths approximately best for them and relate these to the set of tee markers most suited to them for any hole. For example, if a golfer normally drives 200 yards, a middle distance par 3 hole for them could be about 140 yards. They typically could not reach a par 3 over 176 yards in length with their longest metalwood other than their driver. The par 4 holes they could reach in two shots range from 201 to 376 yards. And under these hypothetical conditions, it would take them three shots to reach 377 yards and longer. All of the distances in this chart are in yards. Meters can be obtained by multiplying any of these distances by .914. Everyone should understand that these yardages for golf holes were only mathematically calculated, based on a very limited number of golfers' shots measured on a flat fairway near sea level. Each golfer is unique with their own swing, their own clubs, some of them with "strong" irons and "weaker" metalwoods or vice versa, playing with different brands of golf balls and a multitude of other variables. Golf holes also vary greatly in regard to contours, elevation, type of turf, hazards which influence how they are played and even day to day changes in wind, temperature, moisture, condition of the turf and other elements. So any general distance guide for golfers playing golf holes can only be generalizations. Course operating personnel and officials setting the tee markers for a competition each day must be specific. Golf course architects designing new courses or remodeling the holes of existing courses must set exact locations for the teeing areas. Except for the USGA's guidelines for the yardages for the par of holes for men and for women, there seems little else available to go by in these regards. These golf course people might use my chart of hole lengths as a starter for locating markers and teeing areas. Then for the most satisfactory results, they must also consider a number of essential factors about each hole, playing conditions and the golfers. A golf course architect often has limits for designing a new course and usually has even more restrictions in remodeling existing holes. Locating teeing areas must consider both contours of the land and any physical limits to the holes. Course operators and tournament officials then can only place the tee markers on the teeing areas which are available and suitable. For these decisions good judgment should always be used, to be as fair as possible to as many golfers as practical. Golfers could become discouraged if they simply can't reach greens in regulation, even with their longest shots. Those additional shots to get to the greens makes them take more time to complete golf holes. That contributes to the potential problem of holding up and frustrating the players behind them. If a course has the teeing areas and the sets of markers offering most golfers enough of a range of distances for each hole and the golfers choose the most suitable length for themselves, it could be a happier day for all. Everyone setting the markers for a tournament should remember that holes too long for some participants to reach in regulation strokes sets up holes much more difficult to those golfers. Golf course architects of new courses or in remodeling old ones will do a better job for their clients and for future players of those courses, if they design enough sufficiently-spaced-apart teeing areas to handle the wear and give short hitters a "fighting chance". By playing from the tees which best fit their length, golfers have a better chance of enjoying golf. By golfers playing from the tees which best fit their length, this is likely to help in speeding up play. Existing courses lacking teeing areas to permit locating sets of tee markers suitable for all of their golfers, should remodel to provide those areas. Then, as all courses should do, their sets of markers should regularly be located for the types of golfers who play the course and golfers should be urged to use the markers best suited to their length. New par 70 to 72 courses, with holes designed primarily for shorter and medium-length golfers need less land, are slightly cheaper to construct, are somewhat less costly to maintain, are easier to walk and take less time to play than longer or "championship" courses. Such smaller and "saving" courses could nicely fit the games of a large number of existing and future golfers. There is a big movement to bring more people into golf, especially kids. Golf is healthful outdoor exercise in a safe environment. Golf can be an outlet for some of the energy of youth and even has the potential for helping kids learn more personal discipline, sportspersonship and etiquette. The game gives these opportunities to young people, if the length of the holes they have available to play are not so long to cause them to quickly quit. As far as some strong men golfers can hit today's golf ball, it takes an awful lot of land, money and playing time to have four long enough par 3 holes, 10 long enough par 4 holes and four long enough par 5 holes that will sufficiently challenge a balance of all of those golfers' clubs. More efficient future courses, giving all types of golfers and course operators the most for their buck, are layouts with mostly par 3 holes. Those courses will not have holes like now make up most existing par-3 courses and certainly not any pitch-and-putt courses. This brand of new course must have all holes well-designed, well-constructed, well-maintained and be well-operated courses. The par 3 holes would require all golfers to hit the full range of their clubs, except driver. A couple of short par 4 holes would allow for a driver. 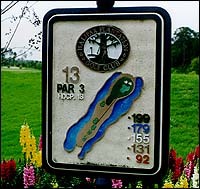 A number of sets of tee markers would give golfers a wide choice of distances to the green on each hole. This would be so one set of markers would allow any type of golfer to hit approximately the same club as every other golfer could hit on that hole. A simple, equalizing solution! 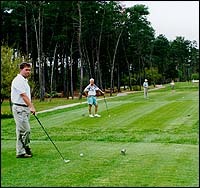 Then all a golfer would benefit from is golfing skill, accuracy, course management and some luck. What else could be asked?